General Tukur Yusuf Buratai like his boss, Muhammadu Buhari is just another parrot mimicking what past brutes like him had said before various countries split in half or more. He is a toothless bulldog, who cannot stop history from following its course, and cannot withstand the surge of fulfillment a prophetic pronouncement carries. Like the singing bird, he has easily sang his woeful song of perdition which will befall not only him but anyone who tries to forestall the coming of Biafra. Biafra is older than Buratai the brute and beyond his comprehension. He has soaked his hands with Biafrans blood and thinks he is free, but the truth is that doom is written all over him and as Buhari has become mysteriously irrelevant, eternally incapable and medically unfit to carry on, so would be told of Buratai's fate shortly. Read also:EDITORIAL Biafra: Now That IPOB Is Not An Unlawful Society, What Next? The spirit of Biafra is not one anyone can toy with and go Scot free. The souls wasted will definitely be avenged in due course. The ailing and dying will not relent but fight on until Biafra is born! This is the unconquerable spirit of Biafra. Therefore Tukur Yusuf Buratai must beware ! It advisable for him to learn from Pharoah, who threatened saying" let me see the God that will deliver you from my hands, he perished in the sea! Let him not forget the minister who doubted the prophecy of plenty and according to the prophet's curse, saw the bounty but never had a share in it. Burutai must realize that Almighty God has declared for us and no uncircumcised Nigerian will come in between. Can Burutai, a Muslim, Northerner tell anything about Biafra or her heritage? How old is he? What does he know about our origins, cultures, languages, principles or beliefs? Can he quantify our status to that of his background? What motivated him to threaten a nation built by God on solid rock? Perhaps his courage stems from the peaceful and civilized manner in which Biafrans have carried themselves so far; he is motivated to spew such empty threats because we are not bloodsuckers. But Buratai must understand that this is not 1967-70. None can take our rights away; We know our stand and mere words of his cannot determine our efforts. The likes of him are opportunists seeking for the Golden fleece in a foreign country with plots to murder the owners and rob them of their heritage. Unfortunately for them, these owners want nothing but Biafra. As they continue to chant " All we are saying..... Give us Biafra!". Buratai should girdle his loins and prepare for the task ahead because he is yet to see how dangerously determined we are to restore Biafra; he cannot comprehend the rate of growth and expansion of Biafran struggle under the leadership of Nnamdi Kanu. 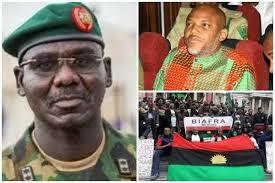 Biafra writers are saying unto you Buratai, you do not own Nigeria! You do not own the right of rulership nor can you decide the fate of Biafrans and Biafra. If i were in your stead, i would be more preoccupied with thinking of better ways to stand against the chosen army of Chukwuokike Abiama when the real battle begins than vomit empty threats that only stir up the anger we feel inside us.